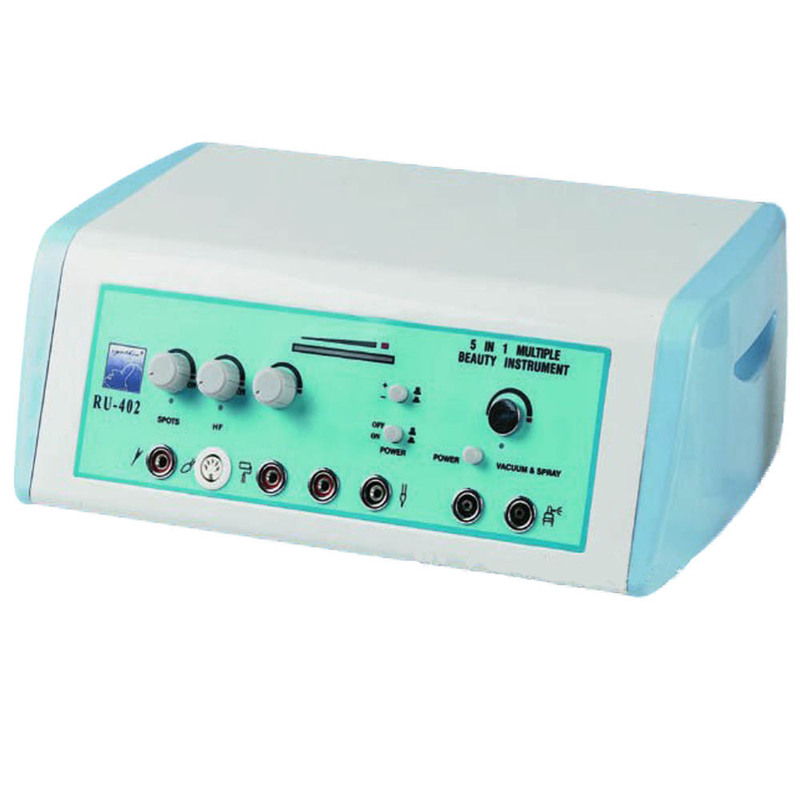 SR-RU402 beauty instrument has HF (high frequency) electropathy, Emaculation, Galvanic induct & educe, Vacuum and Spray functions. Each function has a separated switch, easy and simple to handle. Overcome the defect of traditional multifunctional instrument that with one function break down, all the others could not be used. The machine is with generous, elegant and portable design. Use high-frequency current and infrared ray to diminish inflammation and ease pain. The generated Ozone kill the bacteria, heal and astringe the acne vulnus. It has an effect on regulate sebum secretion, improve the texture of skin, accelerate the blood circulation and speed up metabolism, anti-wrinkle and anti-aging. By means of coagulation of high-frequency electric current, urges the cell necrosis of the epidermis, which can in instaneous thoroughly eliminate all kinds of spot on the face and the other skin surface. The effect is obvious with no bleeding or scar left. It could remove all kinds of spot such as freckle, senile plaque, tattoo etc. No scar, no bleeding. In accordance with opposites attract principle, it help to induct the necessary essence which heal skin disease into dermis and accelerate the absorption, meanwhile, it will educe the impurity. Refine the striper pore, acne, pustule, clean the dirt and lipids inside the pore. Convert the toning lotion, anti-inflammatory lotion or shrinkage water into steam and spray. It is more normative and hygeian.